In excellent condition this is a large vintage Scandinavian Denmark Jemax sterling silver 3 leaf pin with beautiful aqua guilloche enameling and a light gold wash on the back. It is marked Jemax, Sterling, Denmark. Size is 2 1/4" tall North to South by 1 1/2" wide East to West across the center. Condition is excellent. No damage or repair. The back has a little bit of age tarnish that could be polished. The enamel work is gorgeous having the very pretty hard to find ocean aquamarine color. A lovely vintage modernist Scandinavian statement pin for your collection. Vintage Mexican Sterling Silver Aztec Warrior Tribal Pin Age: 1950s-60s (Left Face Eagle Mark - 1955-1960s) Maker: Silmex Size: 1 3/4" diameter across East to West] Weight: 13gr Condition: Excellent, Original, No damage or repair. Very well crafted. 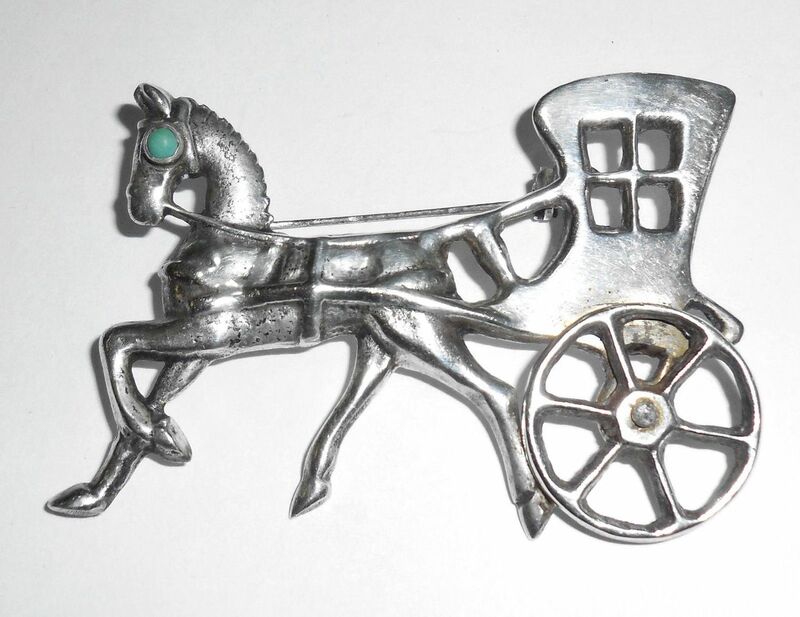 This is a 1940s to early 1950s Art Deco Heavy Mexican sterling silver stagecoach/horse and carriage pin with a large movable wheel and its original turquoise cab stone in the eye. 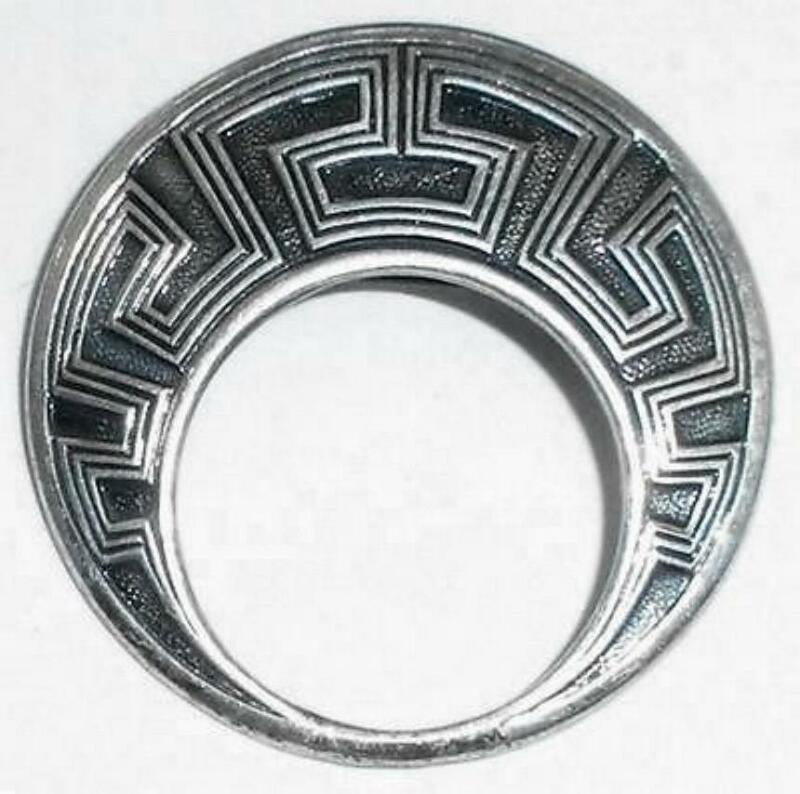 Marked Silver, Made in Mexico. Also, tested and guaranteed to be sterling silver quality. It is solid and very well made by hand. Thick and strong. Excellent condition, from an estate, minor wear only. No cracks, tears, dents or dings. Size is 2 1/4" long East to West by 1 11/16" tall North to South. Weight is 19.3 grams. 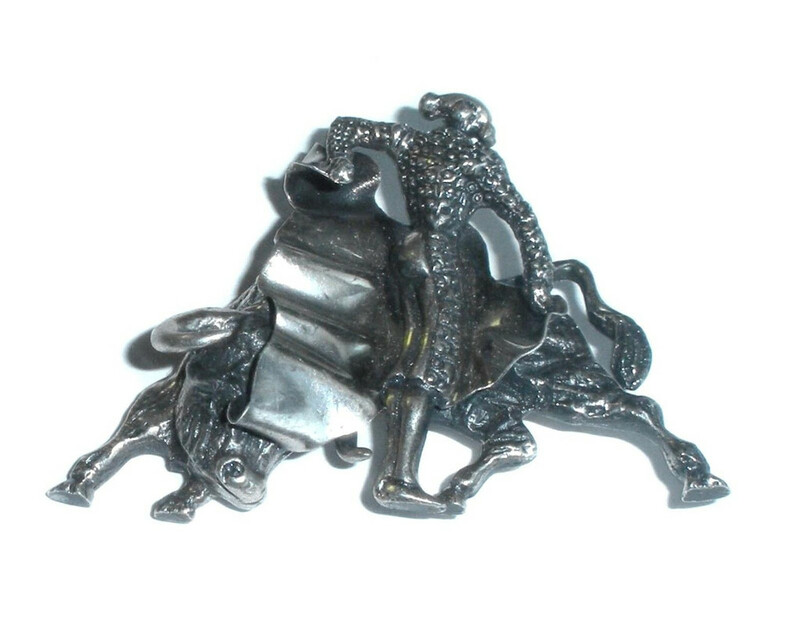 This is a beautiful, early, hand crafted pin for your Mexican silver or Southwestern collection. 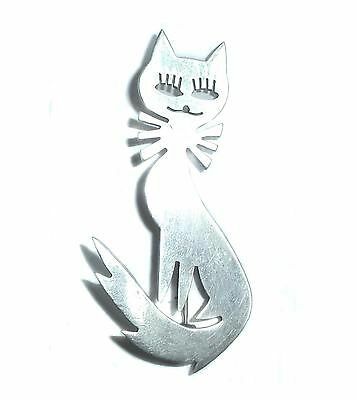 Vintage hand made Mexican sterling silver modernist tall sitting cat pin. Marked 925, TA-109 t indicate Taxco Mexico origin. It measures 2 1/4" tall by over 1" wide across the body. 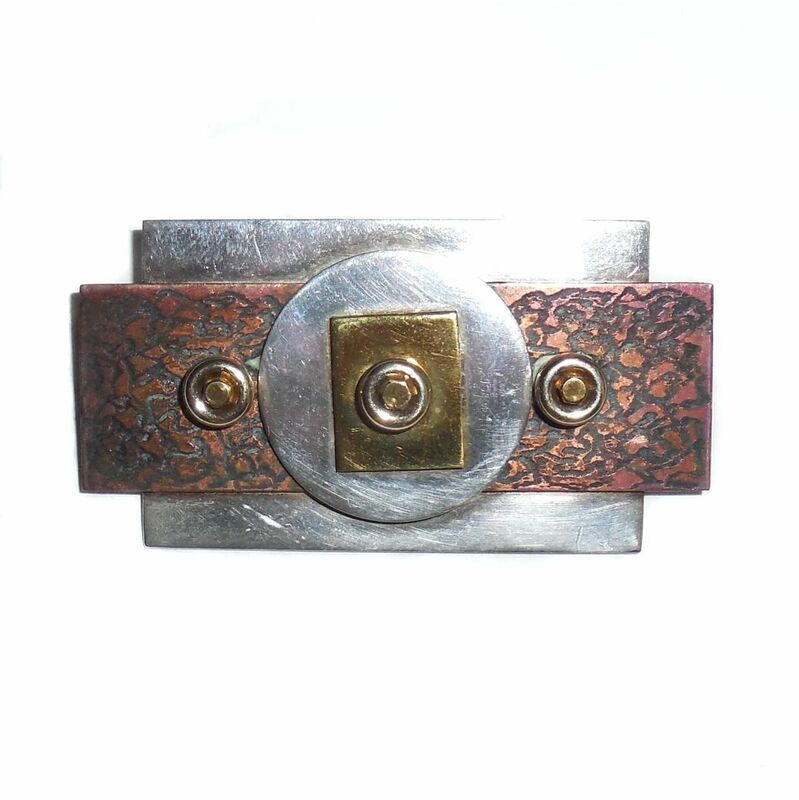 It has fancy deep carved stylized modernist edges and is very well made. Condition is excellent having only light faint surface scuffs which could be polished out but not necessary. 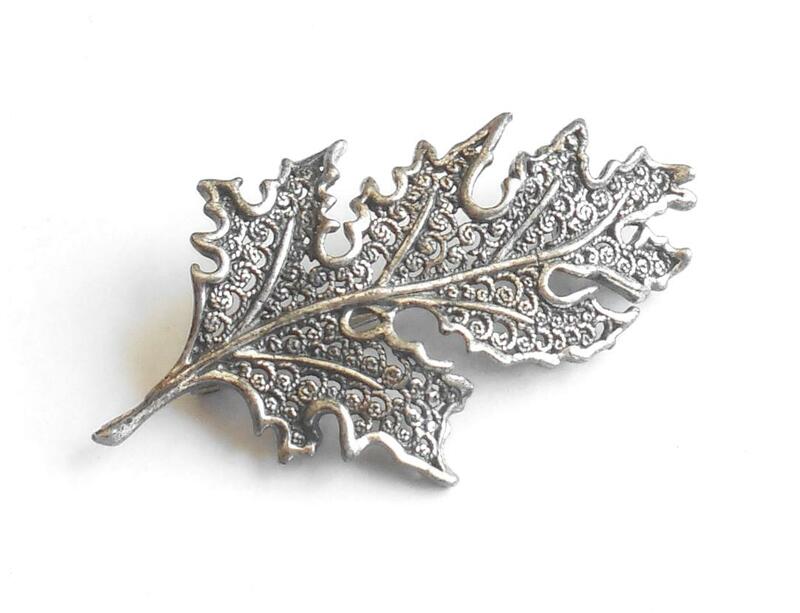 Vintage Mid Century Beau Sterling Silver Fancy Oak Leaf Pin Age: 1960s Metal: Solid Sterling Silver Marking: Beau Ster Condition: Excellent, No damage or repair. Light age wear only. Size: 1 7/8" by 1" wide Please see photos and read full product description below. This is a lovely piece of mid century modernist jewelry by a pupular maker for your collection. 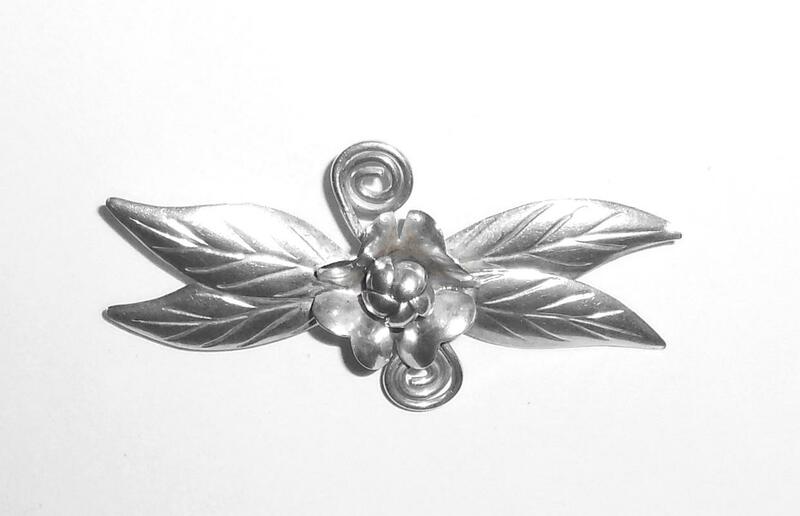 This is a long vintage 1940s-1950s late Art Deco to early mid century modernist handmade sterling silver impatiens or petunia flower pin. It is Marked HAND MADE, STERLING and is also jeweler tested and Guaranteed to be hand wrought solid sterling silver. It is well made, from a mid century estate and in excellent condition. No damage or repair. All original. Never altered. Light age wear on the back. Size is 2 7/16" long East to West by 1 1/8" tall North to South in the center. The leaves have deep veins for detail and the squiggles are all hand wrought. No dents or dings or repair. 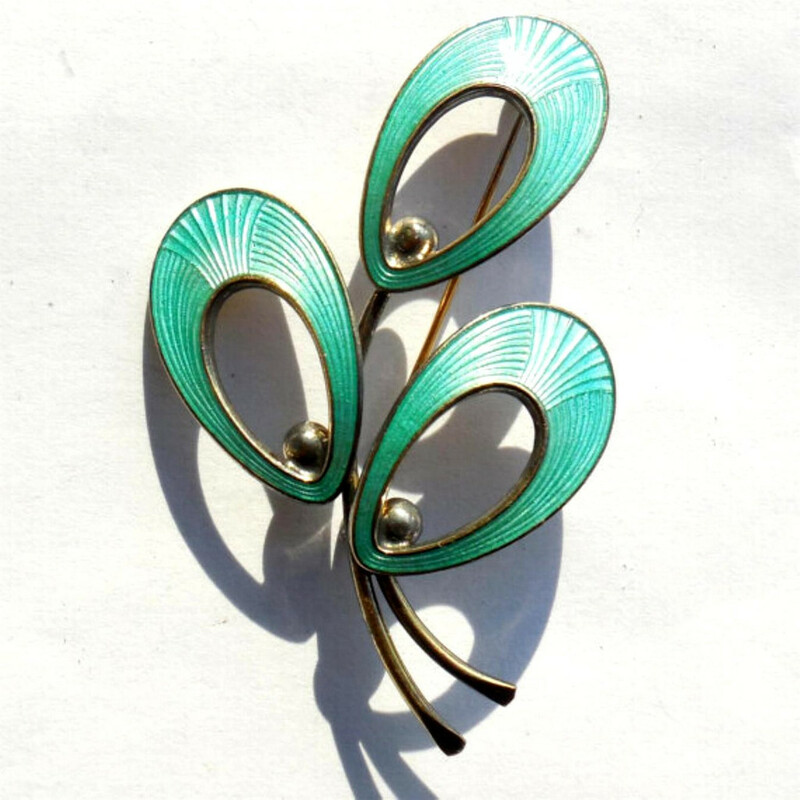 Noticeably handmade, large and showy this is a Art Deco early modernist pin for your vintage statement jewelry collection. Big and long it looks great on any lapel! Lots of photos at different angles and proximities and lighting for your convenience. Vintage Mid Century Modern Stylized Sterling Silver Lily Pin 1940s to 1950s Early Mid Century Modernism. It is hand cast of 1 thick solid chunk of sterling silver that is marked sterling. It is also tested and Guaranteed solid sterling silver. It has sleek, geometric, early mid century design and is quite heavy. Weight is 21.5 grams. The double twin lilies are strong looking and eye catchy. It has one old connecting joint at the top which is raised on one side at the end of the top stem. Could be an old, very old repair or is just from original making. It also has tiny pin prick on the front which you can see in the photos. There are no dents or dings or tears. It is from an estate and not fresh polished. In completely original condition. Size is 2 1/4" East to West by 1 5/8" tall North to South. The sterling silver is very thick and solid; can't bend it. This is a very showy example of mid century modernism silver for your jewelry collection. This would also look great converted to a necklace centerpiece. 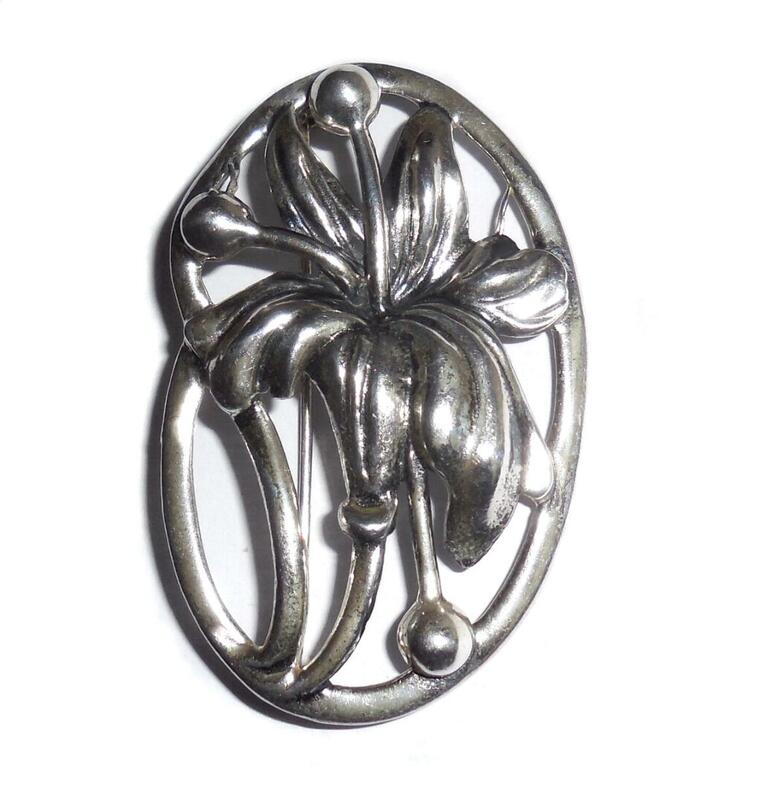 Vintage Mid Century Heavy Sterling Silver Jewelart Lily Pin This is a large, heavy, mid century modern sterling silver pin brooch of a big dramatic lily. It is singed Sterling by Jewelart and was made by Jewelart of Rhode Island in the 1950s to early 60s. It is also jeweler tested and guaranteed to be solid sterling silver. The construction is hand cast , hand finished and very well-made of thick, solid, substantial sterling silver. Weight is heavy at 19.2 rams. Size is 2 3/8″ tall North to South by 1 7/16″ wide East to West across the center. Condition is excellent. No dents. No repair. Directly from the estate of the original owner and not freshly polished out. Completely original, excellent condition. 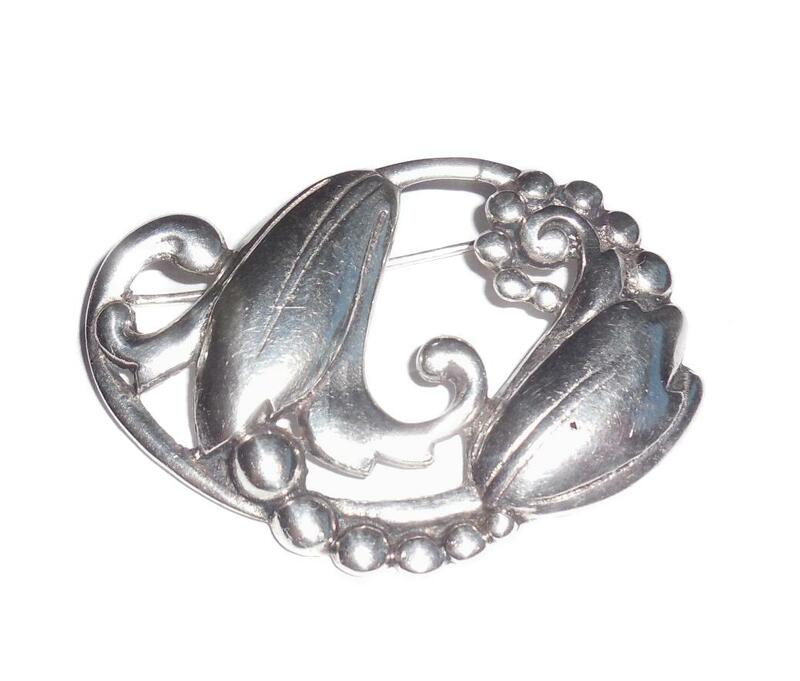 This is a beautiful dramatic vintage statement lily pin for your collection. It is quite showy and has nice depth. 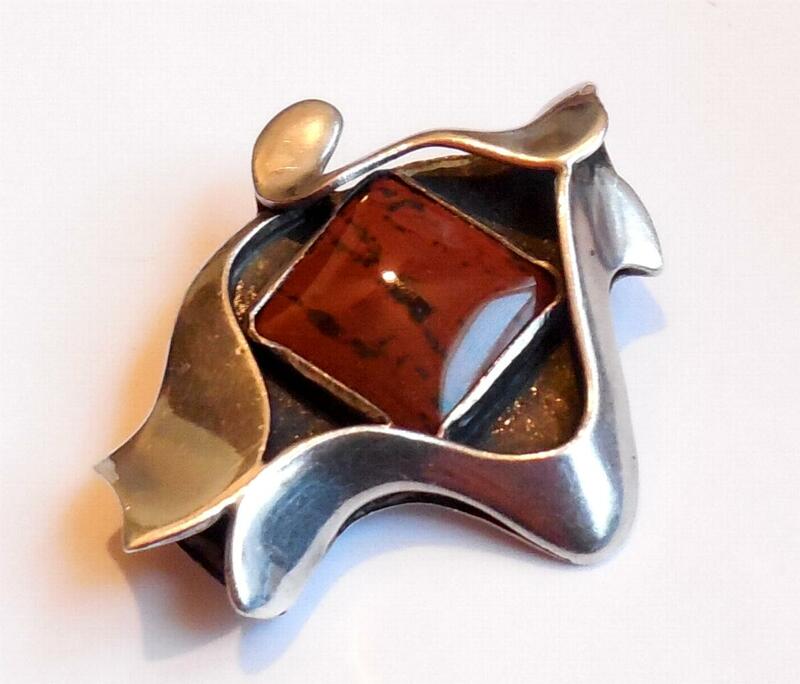 Gorgeous Vintage Mid Century Modernist Mexican Sterling Silver Spotted Red Jasper Pin 1940s 1950s estate jewelry from Taxco, Mexico. 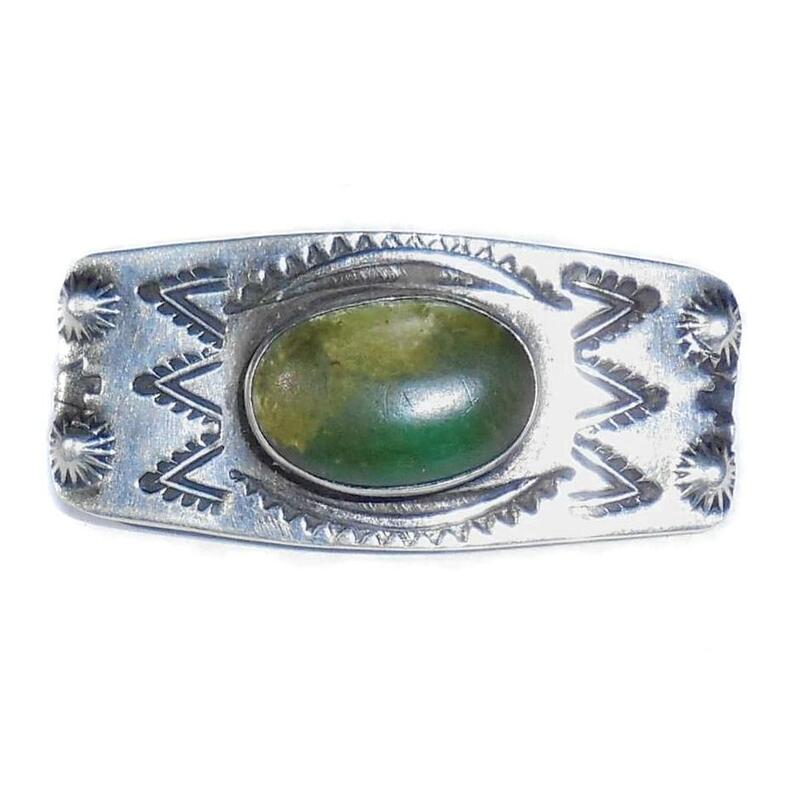 Marked in old circle marking Taxco,, 925, Mexico, and is also jeweler tested and Guaranteed old solid sterling silver pin. It is beautifully hand crafted with a large natural spotted red jasper slab cabochon gemstone in the center. The jasper measures 15mm across and has lovely deep red brown color with lots of black spotting and natural graining. Size of pin measures 2" across East to West by 1 1/2" tall North to South. Condition is excellent, very gently used. No dents or dings. No deep scratches or tears. No cracks or chips of flakes or hairlines. No repair or alteration of any kind. 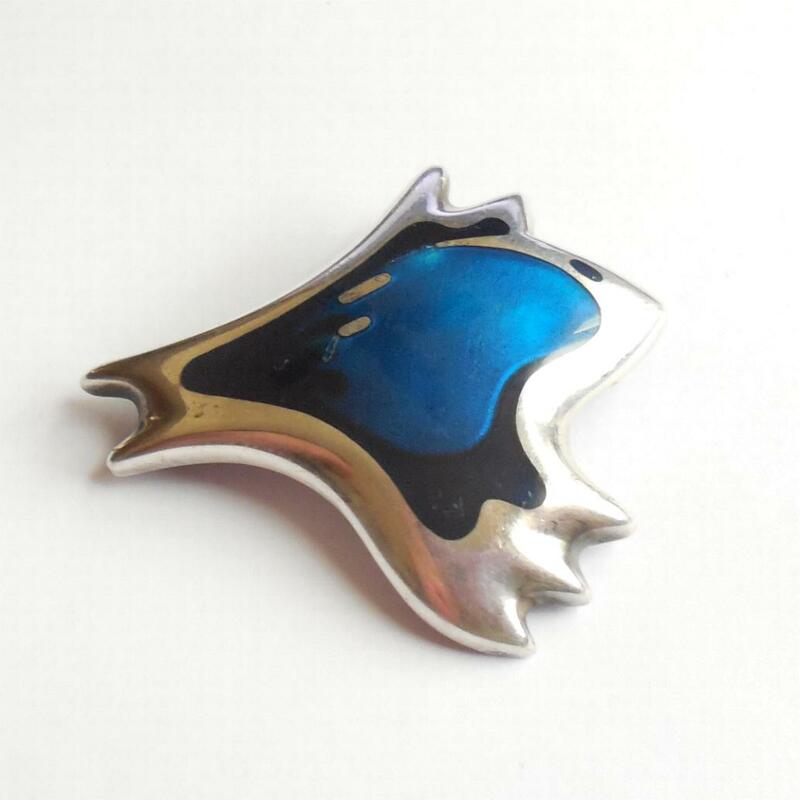 From estate and completely original, this is a stunning abstract modernist statement pin with very fine quality workmanship for your collection. Vintage hand made studio modernist mixed metals pin with sterling silver, textured/oxidized copper and brass. Marked CMK, Sterling. Very well made. Thick, strong, substantial. Excellent Condition. No damage or repair. Size - East to West is 1 7/8". North to South wide in the center is 1". A lovely, showy hand made statement pin for your vintage jewelry collection. This is a vintage hand made Native American sterling silver pin with an azurite malachite cab stone in the center. Older vintage and no mark. Tested and guaranteed to be solid sterling silver. Other than 1 thin craze line to the stone surface it is in excellent condition. No deep scratches. No tears. No repair. All detail is still very crisp and clear. It is well made and from an estate. Size is 2 1/8" long by 3/4" wide. A lovely pin for your Southwestern or Native American collection. 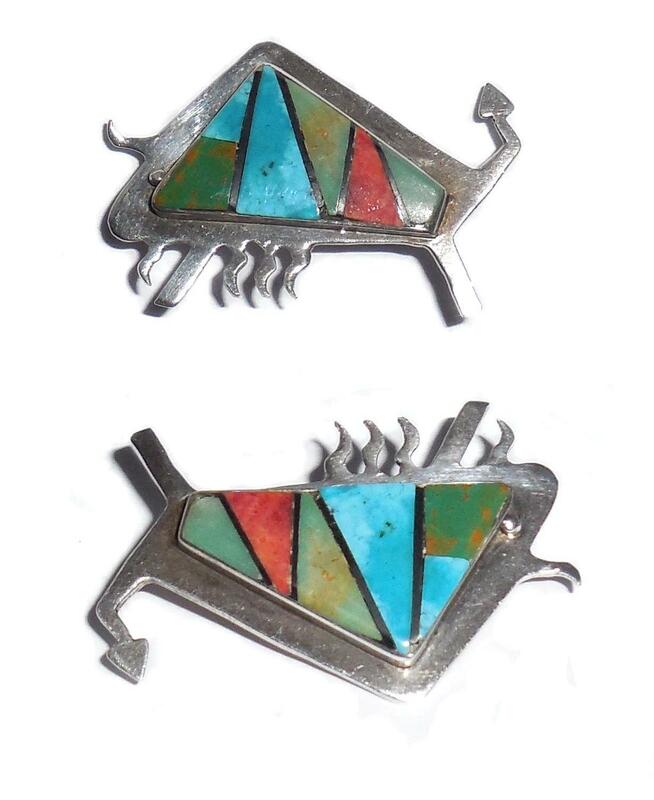 This is an interesting Native American hand made sterling silver modernist pin with colorful gemstone inlay work. Wear it one way and it looks like a fish. Turn it upside down and it looks like a buffalo. It is marked sterling. Also tested and Guaranteed to be solid sterling silver and all handmade. Size is 1 7/16" long head to tail by 1" wide across. Condition is excellent, gently used. The gemstones are all natural with deep color and a couple of natural inclusions on the grain. The green jasper has red spotting and the red coral has linear grain so you know it is natural. The turquoise is also deep grained with beautiful bright color. This is a lovely statement pin for your vintage Native American jewelry collection. Wear it any way you like! 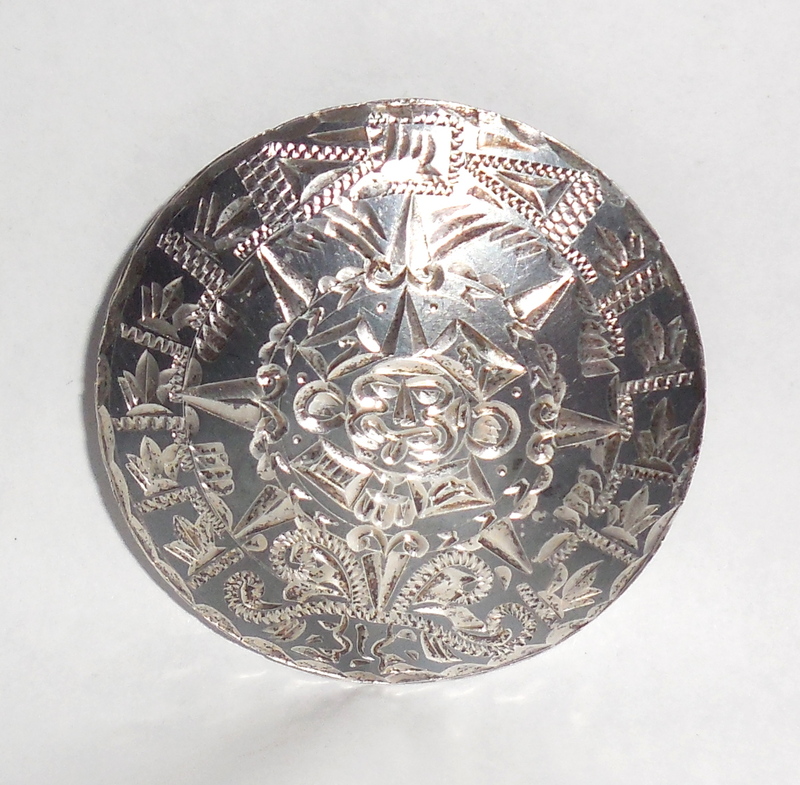 This is a lovely older vintage Native American sterling silver pin with a deeply carved tooled recessed design on the front. The maker's mark is a tomahawk. See photo above. The work is very deep, detailed and crisp. Excellent condition. No dents or dings. Good locking clasp. Size is 1 1/8" across. 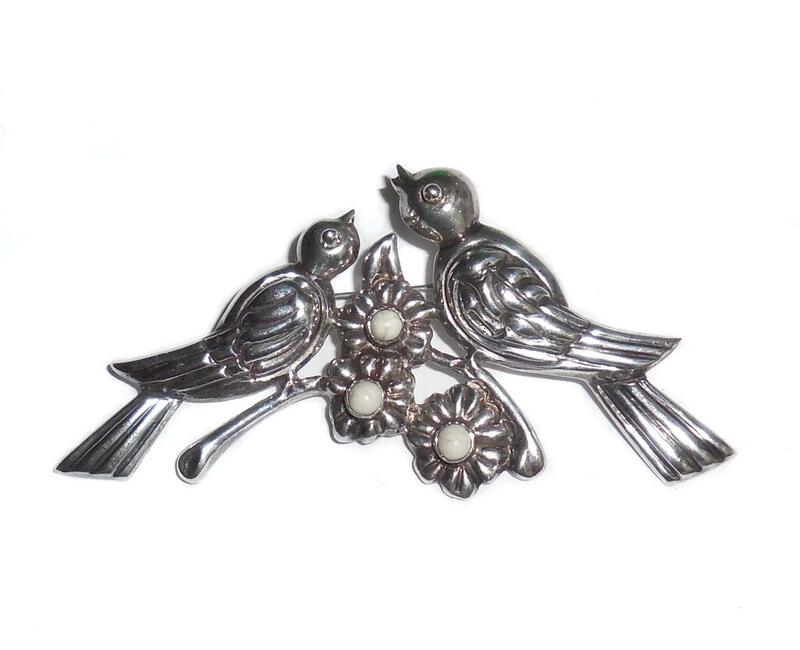 This is a lovely older vintage statement pin for your collection.